Our Future Rooted in Our Past: Need a Old Map England, Wales or Scotland? This site is for You! Need a Old Map England, Wales or Scotland? This site is for You! How many times have you been researching for one of your family members and hit a brick wall because you can't locate the place of their birth, marriage, death or residence? We all know that borders, names of cities, towns, and streets have changed through the ages. What can you do? Well the best solution is to try and find a map of the area and the time period you are researching. This can be a task in and of itself but the Genmaps website is a great resource for the England, Wales, and Scotland maps. Genmaps has maps and charts for each of the counties in England, Wales, and Scotland ranging in years from the 1300's to the 1900's. Each of these maps are available for use by genealogists but the commercial use of the images is forbidden without the permission of the copyright holder. The owners of the website encourage the viewer to contribute a digitized format of their old maps of the area if they desire to share. This is a wonderful community effort of assisting others in their research. 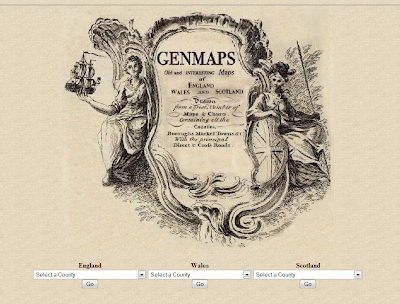 If you would like to browse their maps, click GenMaps. I am sure that you will find some hidden gems. Have fun!